Welcome to the seventy-seventh issue of MetaboNews, a monthly newsletter published in partnership between The Metabolomics Innovation Centre (TMIC, http://www.metabolomicscentre.ca/) and the international Metabolomics Society (http://www.metabolomicssociety.org/), to keep metabolomics researchers and other professionals informed about new technologies, software, databases, events, job postings, conferences, training opportunities, interviews, publications, awards, and other newsworthy items concerning metabolomics. MetaboNews represents the one-stop-shop for the very latest and most critical news about the science of metabolomics. In this issue, we feature a Database Spotlight article titled "The Food Compound Exchange - FoodComEx - a collaborative platform for sharing standards of food compounds and related metabolites", and a metabolomics interview with Christophe Junot of CEA (France). The final Board of Directors Telephone Conference (TC) for 2017 coincided with MetaboMeeting, a metabolomics meeting primarily based in the UK and this year hosted by a snow-covered Birmingham University. This was an excellent meeting which had a nice balance between student and post-doc presentations alongside the keynotes and plenaries, with many travelling from all over Europe—at least if the snow allowed them to travel! On Monday night I had to reluctantly pull myself away from the German Christmas Fair that filled the city centre so I could host the final TC for 2017. However, the talk of future conferences more than made up for forgoing more bratwurst and glühwein. Our main topic was Seattle 2018. As you will see in this newsletter, we are ready to receive your abstracts, and we are busy planning the workshops, plenaries and keynotes (announcements to follow shortly, so watch the website!). However, we also discussed Europe 2019, and expect a formal announcement of the host soon. This is quite a dramatic departure with the past where the Society has only announced the following conference site on the last day of the current conference during the wrap-up presentations. The reason for this change is largely thanks to the organization of the past and present conference committee chairs, Darren Creek and Sastia Putri. Ably assisted by A-S-K Associates and the Conference Committee, Darren and Sastia have planned a three-year cycle of conferences. We hope by making early announcements this will help members plan their travel budgets better and encourage you to attend the International Conference each year as well as the many excellent local meetings, too. So, watch this space for announcements for both Seattle 2018 and Europe 2019 (and possibly soon Asia 2020). The 16th EMN Webinar series was held on December 19th 2017. Dr. Andrew Lane from University of Kentucky introduced Stable Isotope Resolved Metabolomics (SIRM) and its applications to cancer metabolism research. All the videos for the EMN webinar series can be found on the Metabolomics Society website (http://metabolomicssociety.org/resources/videos). Early Bird discount ends on January 15th! Membership of the Society is based on the calendar year and all 2017 members will need to renew their membership to stay in good standing. You can renew your membership for 2018 here. Remember to renew early to take advantage of our early bird discounted registration fees. Join now and save some money! If you have not been a member of the Society before, now is an excellent opportunity to join and enjoy a reduced membership rate. All benefits of membership are available for new members, and will afford discounted registration for Metabolomics 2018. The Food Compound Exchange – FoodComEx (foodcomex.org) is a virtual chemical library developed as part of the Food Biomarkers Alliance – FoodBAll project (foodmetabolome.org) funded by the JPI HDHL. The aim of FoodComEx is to maintain an online catalog of food compounds and derived metabolites that are not usually commercially available, but can be shared by academic laboratories. In the last decades, technical progress in the field of metabolomics applied to the study of food metabolome has enabled more sensitivity and accuracy in metabolite profiling, allowing the detection of a large number of compounds. Despite the considerable progress in this area, the identification of detected metabolites remains a tedious and time-consuming task: The main limitation is the lack of standards of food compounds and their metabolites, which are ultimately needed for validating compound identification and the development of quantification methods. The large diversity of these compounds and the small demand for individual pure standards makes their production by chemical manufacturers unattractive, considerably increasing the price of purified food compounds. Other than their applications in analytical chemistry, pure standards of food compounds are also needed for the investigation of their biological effects in in vitro models. Despite the growing need for purified standards of food compounds and their metabolites by those scientists studying the food metabolome and food health effects, there is a general disconnect between the scientists that need isolated compounds and those groups devoted to isolation and synthesis of food compounds and metabolites. Food chemists and other scientists grow collections of precious molecules that have been isolated or synthesized. Very often, these collections remain hardly accessible. FoodComEx makes these compounds/standards available to a wider community, in the interest of those who produce them and those looking for them. 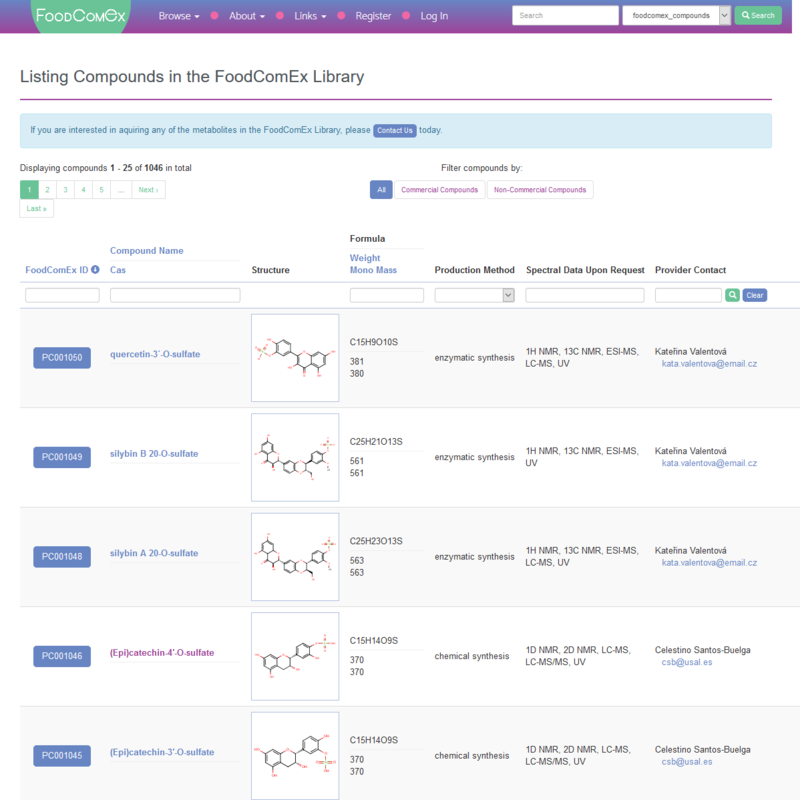 Chemists, food scientists, or others who are interested in sharing compounds synthesized, isolated, or stored in their laboratories can now directly register their compounds in the FoodComEx platform through a user-friendly interface. A video tutorial is available, explaining how to do this step-by-step. Providers will be able to update their contributions whenever they want. Anyone visiting the website will be able to browse the library and, for every compound, obtain information such as the chemical structure, method of production, purity, storage conditions, spectral data, and the contact details of the provider (Figure 1). Those interested in obtaining a given compound will be able to contact the group that is offering it in order to establish a collaboration. 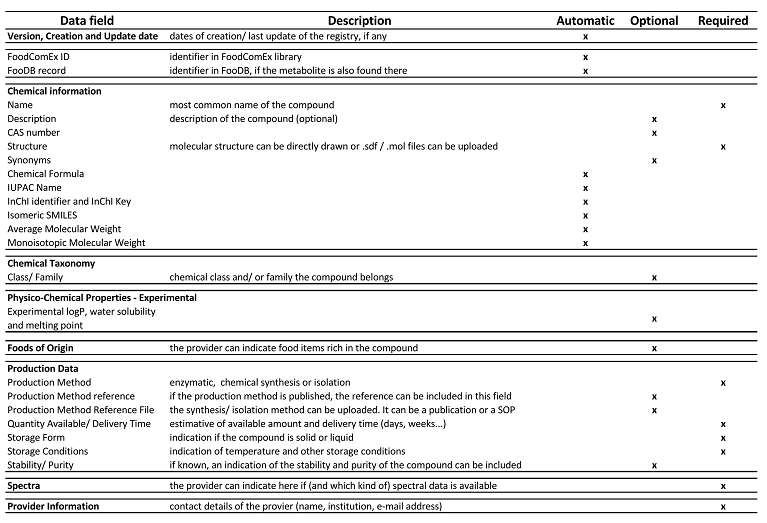 Table 1 describes a technical sheet of a compound in FoodComEx, indicating how easy it is to upload a compound in FoodComEx. Figure 1. Screenshot of FoodComEx library, displaying how the information is organized. Table 1. Presentation of the technical sheet of FoodComEx compounds. Some fields are filled out automatically once a structure is uploaded/drawn while others are required as part of the upload process. FoodComEx can also be used to share compounds bought from commercial suppliers. In most cases, the quantities proposed by vendors far exceed the needs of the average consumer, resulting in a large portion of the standards being wasted. At the same time, only a small amount of compound is required for use as an analytical standard. FoodComEx can also be used to share commercial standards, saving money and connecting groups with related interests. 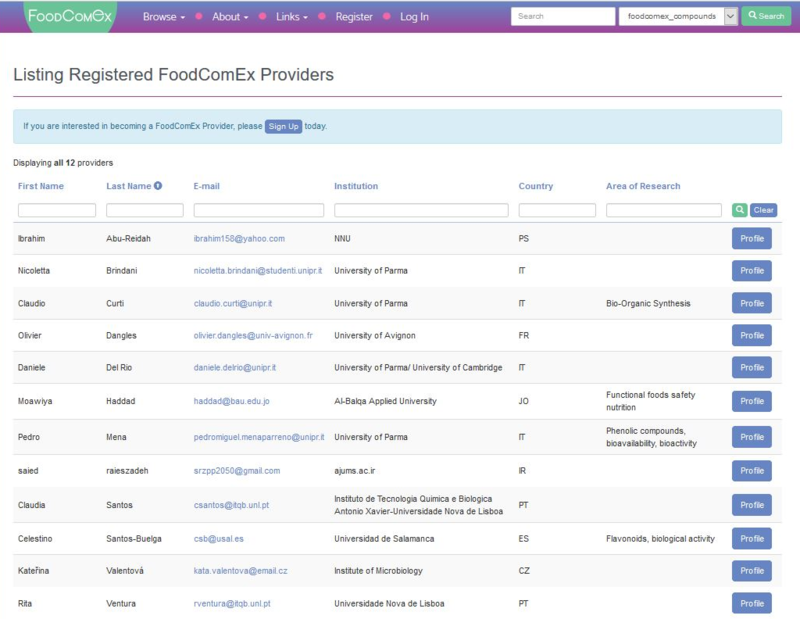 Another way FoodComEx facilitates scientific collaboration is via the "providers directory" – an open list of scientists who registered chemical compounds in the database. Optionally, they can describe their skills and research interests and be found by others seeking to collaborate (Figure 2). 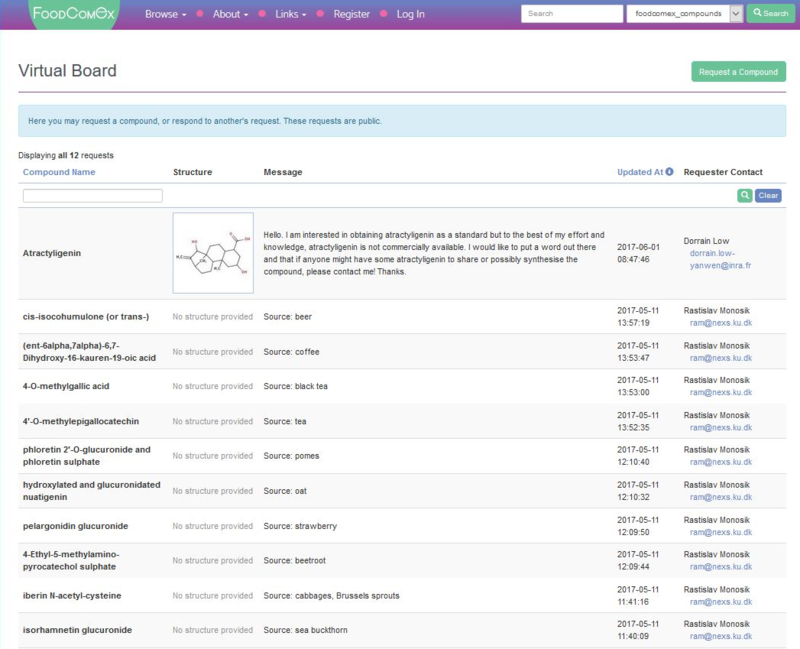 FoodComEx also features a virtual board where users can add wanted compounds, to facilitate their sharing or synthesis by others (Figure 3). Figure 2. "Providers library" – an inventory of scientists that uploaded compounds to be shared in FoodComEx. This list can be queried by name, institution, and area of research, facilitating the interaction among researchers. Figure 3. "Virtual Board" – a list of most-wanted compounds that are requested by users. The aim of this list is to encourage the production of new standards. The use of FoodComEx is free of charge and the platform will be sustained over the years thanks to the bioinformatics capabilities of University of Alberta, which already maintains databases such as HMDB, FooDB, DrugBank, and PhenolExplorer. FoodComEx is in its initial stage of development and its success depends on the participation of scientists willing to share their compounds and establish collaborations. Everyone is invited to participate by registering their compounds in the database and forwarding the information on FoodComEx to colleagues likely to be interested in this initiative. If you have any questions, please contact Jarlei Fiamoncini (jarlei.fiamoncini@inra.fr), who is currently leading FoodComEx development, or Claudine Manach (claudine.manach@inra.fr). This section features interviews with prominent researchers in the field of metabolomics. The aim of these interviews is to shed light on metabolomics researchers around the world and give them an opportunity to share their metabolomics story. In this issue, we feature an interview with Christophe Junot. Christophe Junot (Pharm.D, Ph.D) joined GlaxoSmithKline laboratories and developed experience in the field of pharmacokinetics and metabolism applied to drug discovery for two years in 2000. Since 2002, he has worked at CEA (a French Technological Research Institute), where he develops mass spectrometry-based metabolomics for biomedical applications. 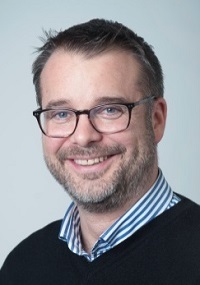 He is now head of the Pharmacology and Immunoanalysis unit (SPI), and also the deputy coordinator of the French MetaboHUB infrastructure for metabolomics and fluxomics. In October 2016, he was elected as a member of the board of directors of the Metabolomics Society. CJ: After my PhD, I spent two years in the pharmaceutical industry (GSK laboratories) as a research scientist involved in Drug Metabolism and Pharmacokinetics. I realized that the main issue regarding drug discovery programs was the prediction of toxicity and its translation from animal models to humans. Thinking that biomarkers could play a role to address this issue, I decided to move to CEA in order to develop methods for the discovery of toxicity biomarkers by using liquid chromatography coupled to mass spectrometry (LC/MS). This research activity was funded by a research program on nuclear toxicology, aimed at identifying biomarkers for the toxicity of heavy metals in microorganisms (yeast, cyanobacteria), plants (A. thaliana) and rodents. We started by performing a survey of the literature with the aim to develop a multiplexed method for profiling biomarker candidates. Unfortunately, we realized that data were too sparse. We thus decided to develop untargeted metabolomics based approaches. We published our first proof of concept paper dealing with Cadmium toxicity in rats by using LC/MS in 2003 (Lafaye A et al., Rapid Commun Mass Spectrom, 2003). CJ: An important part of the work of my group is dedicated to the development of liquid chromatography coupled to high resolution mass spectrometry methods for metabolomics. These methods are used for metabolome annotation in order to characterize new metabolites in biological fluids such as plasma, urine, CSF (cerebrospinal fluid), and also cell extracts (red blood cells, S. aureus). Another important aspect of our work deals with collaboration with clinical teams for disease biomarkers discovery, especially in the fields of hepatology, neurology and rare diseases. CJ: First of all, my colleagues and I are involved in MetaboHUB, the French infrastructure in metabolomics and fluxomics. One of the key projects is the development of a spectral database ("PeakForest") for annotating mass spectrometry and nuclear magnetic resonance based metabolomic data sets. We also have an exciting collaboration with MedDay Pharmaceuticals, a company that develops new drugs targeting brain metabolism to treat diseases of the nervous system and that uses metabolomics in order to discover new targets. In this context, we have established a metabolic signature of hepatic encephalopathy in human cerebrospinal fluid (Weiss N et al., J. Hepatol., 2016). CJ: The French metabolomics and Fluxomics network (RFMF) was launched in 2005 (www.rfmf.fr) and includes around 300 members. It has carried out numerous activities (scientific meetings, research schools, workshops, travel grants, web site, etc.) covering all fields of metabolomics in France. Since 2013, the RFMF has been affiliated with the Metabolomics Society; and in 2015, it has been reaching out to the French speaking community, with colleagues from Belgium (Dr. Pascal de Tullio) and Switzerland (Dr. Julien Boccard), who have been elected to the board of directors of RFMF. Otherwise, the French Infrastructure in Metabolomics and Fluxomics (MetaboHUB, www.metabohub.fr) has been funded by the French government since 2012 and for an eight year period. MetaboHUB includes four platforms that provide tools, training sessions, and services to academic research teams and industrial partners in the field of health, nutrition, agriculture, environment, and biotechnology. User requests are now managed and centralized by a web application (MetaboHUB Analysis MAnager). MetaboHUB has developed bioinformatics tools such as "Workflow4Metabolomics" (W4M, http://workflow4metabolomics.org/), a free and open source metabolomic data processing software tool (in collaboration with the French Bioinformatics Institute), "NMRProcFlow", an open source software that provides a complete set of tools for processing and visualization of 1D NMR data (http://nmrprocflow.org/), and "MetExplore", a web server dedicated to the analysis of genome-scale metabolic networks (https://metexplore.toulouse.inra.fr). CJ: Our spectral database is already used by colleagues for data set annotation, in the frame of collaborations. I hope that the mass spectrometry-based tools and metabolic signatures of pathologies developed by colleagues in my unit could be transferred to clinical chemistry laboratories and used by clinicians for diagnostic and patient follow-up. CJ: Metabolomics is an efficient way to track interactions of biological organisms with their environment. It brings a wealth of information, ranging from energy metabolism, interaction of the host with its microbiota, to chemical/biochemical exposome. It is thus a promising tool to link chronic and multifactorial diseases with the environment, in addition to other kinds of omics approaches and clinical metadata. CJ: Of course, one of the greatest barriers is the issue of metabolite identification, with our limited knowledge on the origin of metabolites. I also think that the necessity of developing large-scale absolute quantification is still underestimated. This should improve data sharing and its use over a long period of time. The lack of efficacy for data visualization is also a major issue that is shared with the other omic approaches. CJ: The situation is far from ideal. It is difficult to fund basic research programs, at least in France and Europe. However, in France, there is room for projects dealing with the discovery of disease biomarkers in collaboration with SMEs (small and medium-sized enterprises) and clinicians in the field of personalized medicine. MN: What role can metabolomics standards play? CJ: I believe that metabolomics standards play an important role to structure the metabolomics community, by improving and facilitating data reliability and sharing. I am happy to contribute to the Metabolite Identification Task Group of the Metabolomics Society. CJ: I believe that many metabolic pathways remain to be discovered and that metabolomics will be essential for patient stratification in the field of personalized medicine. The future is to make metabolomics as reliable as possible in order to facilitate the acquisition of multi-omic signatures of disease. A pilot study comparing the metabolic profiles of elite-level athletes from different sporting disciplines. Integration of metabolomics and transcriptomics in nanotoxicity studies. 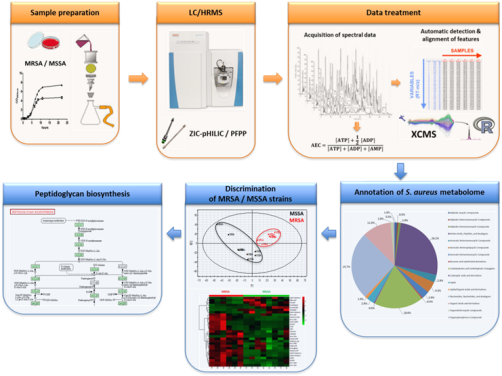 A quantitative multimodal metabolomic assay for colorectal cancer. SistematX, an Online Web-Based Cheminformatics Tool for Data Management of Secondary Metabolites. Discovery of human cell selective effector molecules using single cell multiplexed activity metabolomics. Respiratory syncytial virus and rhinovirus bronchiolitis are associated with distinct metabolic pathways. NMR-Guided Mass Spectrometry for Absolute Quantitation of Human Blood Metabolites. New tools and resources in metabolomics: 2016-2017. An exploratory LC-MS-based metabolomics study reveals differences in aqueous humor composition between diabetic and non-diabetic patients with cataract. ROMANCE: A new software tool to improve data robustness and feature identification in CE-MS metabolomics. For further information and to register, please visit https://www.futurelearn.com/courses/metabolomics. Bursaries for NERC funded scientists: While this course is open to all researchers with an interest in the environmental sciences, it is a NERC-funded Advanced Training Short Course and hence priority will be given to NERC funded scientists. This 2-day NERC-funded Advanced Training Short Course will provide environmental scientists with an overview of the metabolomics pipeline. The course is intended for environmental scientist with little or no previous experience of metabolomics and who are interested to discover how this relatively new and powerful approach could be integrated into their research. Experts working in the NERC Metabolomics facility-NBAF-Birmingham will teach the course. For further information and registration details, please visit https://www.birmingham.ac.uk/facilities/metabolomics-training-centre/courses/introduction-metabolomics-environmental.aspx. This course will provide an overview of key issues that affect metabolomics studies, handling datasets and procedures for the analysis of metabolomics data using bioinformatics tools. It will be delivered using a mixture of lectures, computer-based practical sessions and interactive discussions. The course will provide a platform for discussion of the key questions and challenges in the field of metabolomics, from study design to metabolite identification. This course is aimed at PhD students, post-docs and researchers with at least one to two years of experience in the field of metabolomics who are seeking to improve their skills in metabolomics data analysis. Participants ideally must have working experience using R (including a basic understanding of the syntax and ability to manipulate objects). For further information, please visit https://www.ebi.ac.uk/training/events/2018/embo-practical-course-metabolomics-bioinformatics-life-scientists-4. Make plans to attend the 4th Annual Metabolomics Symposium on Clinical & Pharmaceutical Solutions through Analysis (CPSA Metabolomics 2018). This unique event is highly interactive and dedicated to the needs of the clinic. The program features updated perspectives and experiences on clinical and pharmaceutical analysis. Imagination and stimulating discussion are central to each CPSA Metabolomics session and event. The goal of CPSA Metabolomics is to provide in-depth review of innovative technology and industry practices through open discussion of industry-related issues and needs. This annual event is specifically geared to the needs of professionals attempting to keep pace with faster development times and technology marketing managers attempting to benchmark emerging trends.